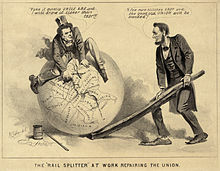 An editorial cartoon of Andrew Johnson and Abraham Lincoln, 1865, entitled "The Rail Splitter at Work Repairing the Union". The caption reads: (Johnson): "Take it quietly Uncle Abe and I will draw it closer than ever." (Lincoln): "A few more stitches Andy and the good old Union will be mended." An editorial cartoon better known as a political cartoon, is a drawing containing a commentary expressing the artist's opinion. An artist who writes and draws such images is known as an editorial cartoonist. They typically combine artistic skill, hyperbole and satire in order to question authority and draw attention to corruption, political violence and other social ills. Political cartoons and other graphic images had depicted the possible social catastrophes surrounding female advancement since before te creation of the United States (Franzen and Ethiel), Woman Suffrage , for instance, held a multitude of possible horrors: usually, cartoons depicted a woman in a tie, smoking a (Freudian) cigar and dominating a man, often her husband. In this logic, a woman with the masculine prerogative of the vote would naturally become masculinized, wearing pants and sitting in indelicate poses. If women became masculine the equal and opposite reaction was that men would then become feminine, adopting female duties and behaviors like childcare and homemaking. The cartoons depicting and negotiating these fears addressed social apradigms about women's roles, about masculinity and feminimity and they set an historical precedent in graphic are for later representations of women. Donna B. Knaff, "A Most Thrilling Struggle Wonder Woman as Wartime and Post-War Feminist" in The Ages of Wonder Woman: Essays on the Amazon Princess in Changing Times, edited by Joeph J Darowski, p.22-23. What would a respectful political cartoon look like? Salman Rushdie, at a Dalkey Book Festival debate; as quoted in "Salman Rushdie: ‘You have to accept a certain level of disrespect’" Sorcha Hamilton, The Irish Times, Jul 21, 2014. This page was last edited on 1 August 2017, at 17:05.